O-rings get lost periodically and get warped/worn out over time. A damaged o-ring (or no faucet o-ring, at all) means a poor seal, leading to a leaky mess. Always have a spare o-ring on hand! Faucet o-rings help eliminate faucet leaks and provide a positive shut off. Danco's Rubber Faucet O-ring Assortment helps not only the Plumbing Professional, but the everyday DIY'er. 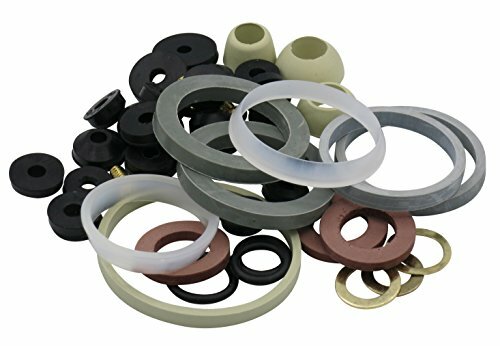 These o-rings (also known as faucet gaskets or seals) are made from a high-quality rubber and this o-ring assortment includes Danco #5, #6, #7, #8, #9, #10, #11, #12, #13, #14, #16 and #27 o-rings. 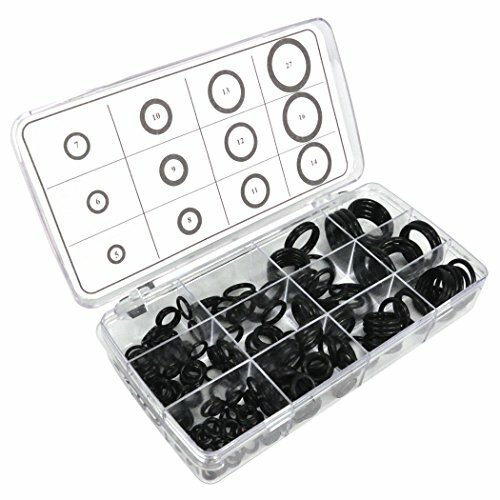 This o-ring assortment includes a beveled design allowing for full water flow. Danco o-rings have a high abrasive resistance and temperature resistance. Danco o-rings will withstand heat between a temperature range of 86°F to 248°F (-30°C to 120°C). These tough and pliable Buna-Nitrile Rubber (NBR) o-rings will help provide long-term use for your plumbing needs. 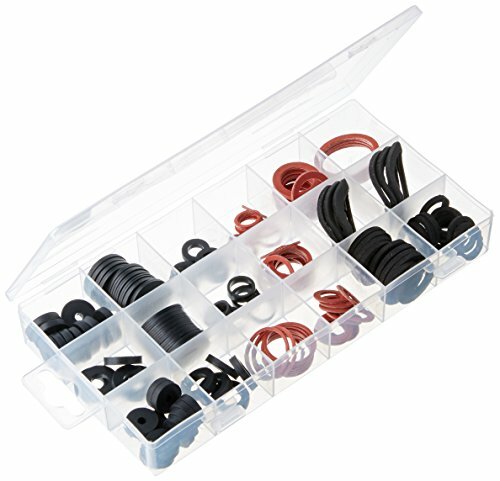 This o ring assortment kit is perfect for your faucet repair. Order yours today! LASCO 02-1150 Faucet Bibb Flat Pig nose Washer and Screw Assortment Kit, 12-Compartment Plastic Box with Labels . 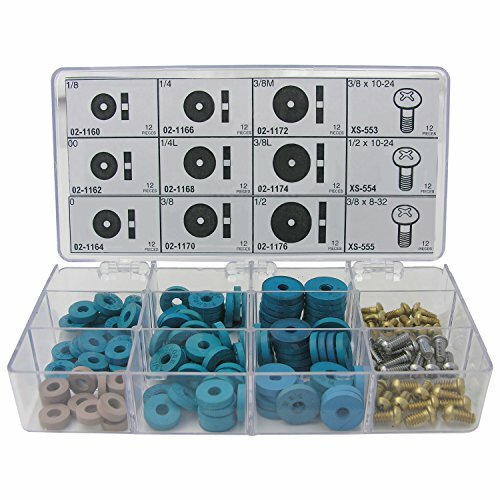 Flat pig nose style bibb washer and screw assortment kit, made of blue softer rubber. 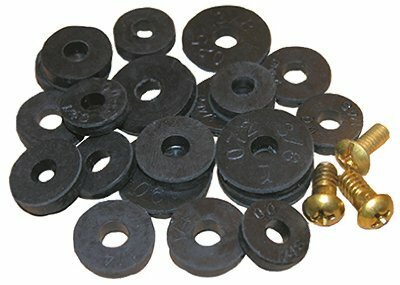 There are 12-sizes of flat bibb washers and 3-sizes of brass bibb screws. Larsen Supply a third generation family owned and operated company with over 80 years of experience has the largest retail plumbing line in the industry today with over 7000 packaged and 16,000 bulk SKU's. We pride ourselves on service, selection and support! All Lasco merchandise if warranted to be free of manufacturing defects. Please revert to retail place of purchase for resolution of any possible plumbing questions, warranty or defective part replacement. 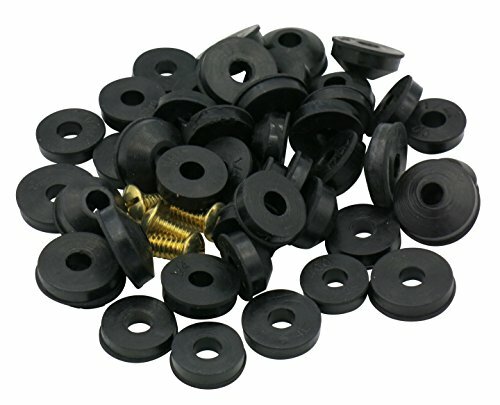 The Flat and Beveled Faucet Washer Kit contains 500 assorted faucet washers in 18 different sizes. The kit includes: (1) Box, (30) 1/4" Small Beveled - Brown, (30) 1/4" Medium Beveled - Blue, (30) 1/4" Regular Beveled - Green, (30) 1/4" Large Beveled - Purple, (30) 3/8" Regular Beveled - Grey, (25) 3/8" Medium Beveled ? Purple, (25) 3/8" Large Beveled ? Orchid, (25) 1/2? Regular Beveled ? Pink, (20) 5/8? Regular Beveled ? Yellow, (25) 5/8? Regular Flat ? Yellow, (25) 1/2? Regular Flat ? Pink, (25) 3/8" Medium Flat ? Purple, (25) 3/8" Large Flat ? Orchid, (30) 3/8" Flat Beveled - Grey, (30) 1/4" Small Flat - Brown, (30) 1/4" Medium Flat - Blue, (30) 1/4" Regular Beveled - Green, (30) 1/4" Large Beveled ? Purple, and (35) 1/4" Large Beveled ? Brown. Danco is one of the largest plumbing repair, replacement, and remodel suppliers in the home improvement industry focused largely on empowering 'Do-It-Yourself' consumers with plumbing solutions that are as practical as they are affordable, giving your home a more fresh appeal and renewed elegance. We provide stylish design-oriented innovative home solutions that are user-friendly to support and encourage customers to tackle home improvement tasks on their own - without the heavy price tag of professional services. Replacing the washers is an easy and economical alternative to replacing the entire faucet. 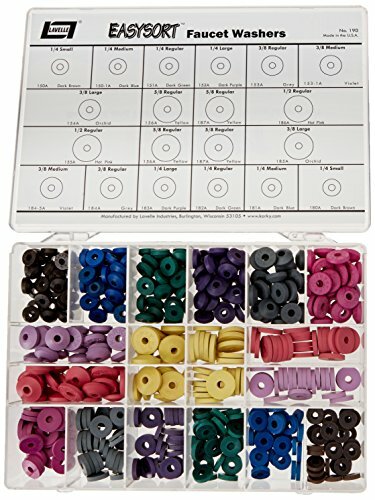 This Danco 100-Piece Assorted Flat Washer Set includes 10 sizes from 00 to 5/8. 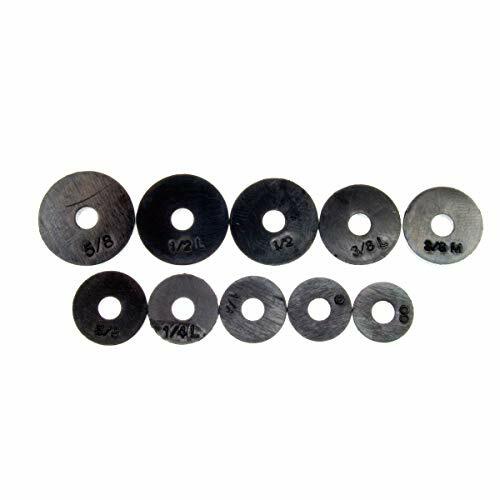 The washers feature rubber construction and can be used on quick-opening faucets. Order yours today! Stop that steady drip, drip, drip before it becomes a stream. Repairing that dripping, leaking faucet will halt the drain on your wallet. For more home repair how-tos, home improvement help, technology tips, garden hints, recipes, holiday ideas and more, visit http://www.homefrontstan.com. Want more Faucet Washer similar ideas? Try to explore these searches: 10 Awg Marine, Pacific Scented Body Wash, and Quote Gifts.